MUMBAI – MAHARASHTRA – INDIA August 30, 2017 07.10 P.M.
A classical singer of repute, Kishori Amonkar died in Mumbai on April 03, 2017 at the age of 85 . A performer of classical music, she also excelled in khayal, Thumri & Bhajan singing. She gave play back for only 2 Hindi films and in total sang just 6 songs. 1st was V. Shantaram’s ” Geet Gaya Patharon Ne ” [ 1965 ] , which was incidentally Jeetendra’s debut movie. She sang the title song in the film. Her 2nd film was ” Dristi ” [ 1991 ]. She sang all the 5 songs and also composed music. A mighty super-star during Amitabh Bachchan era, Vinod Khanna succumbed to cancer and died in Mumbai hospital on April 27, 2017. He was 71 at the time of his death. He made debut as the main villain with ” Man Ka Meet ” [ 1968 ]. This film was directed by A. Subba Rao and produced by Sunil Dutt. Later on he acted in supporting roles; as an angry young man in the movie Mere Apne, as the main villain in the super-hit movie Mera Gaon Mera Desh, and as the military officer turned fugitive in the critically acclaimed movie Achanak . After above mentioned films, Vinod Khanna played lead roles in many films and is best remembered for his performances in Kuchhe Dhaage, Gaddaar, Imtihaan, Muqaddar Ka Sikandar, Inkaar, Amar Akbar Anthony, Rajput, The Burning Train, Qurbani, Kudrat, Parvarish, Khoon Pasina, Dayavan, Chandni and Jurm. In 1982, at the peak of his film career, he temporarily quit the film industry to follow his spiritual guru Osho . After a 5-year hiatus, he returned to the Hindi film industry with two hit films; Insaaf and Satyamev Jayate. In total ………..……… 12 ………..….. films got released in April 2017 . Out of these ……………..….. 12 …………………… released films ………………….. 03 ……………………… films have …………… 03 ……………. artistes , who are trained by me . My 03 students appeared in 03 films. Total number of students working in the month of April 2017 is 03. On behalf of all the students & staff of VIDUR Acting Institute , VIDUR Editing Studio , VIDUR Club and VIDUR Merchandise, I congratulate my above mentioned 03 students . MUMBAI – MAHARASHTRA – INDIA July 10 , 2016 07.30 P.M.
As an ACTING TRAINER my success rate was 40% in the year 2013 – 2014 . It jumped to 55% in 2014 – 2015. And in 2015 , it zoomed up to 62.35 % . This is unprecedented for any ACTING INSTITUTE or ACTING TRAINER across the world. I am continuously writing Vidur’s Film Diary since 8 years. And to my utter surprise I have noticed that there were no lean months ever. It never happened that a month came and there were none of my students in any of the 5 fields of entertainment, which my diary covers. In fact there were more than a dozen working students every month. Razak Khan, who died on June 01, 2016 in Mumbai following a heart attack, was noted for supporting and comic roles. Razak Khan began his onscreen journey with a small role in the famous television show, Nukkad (1986–87), and made his Hindi film debut with Roop Ki Rani Choron Ka Raja [ 1993 ]. His other noteworthy performances were in Raja Hindustani (1996), comic role of Manikchand in the Abbas-Mustan directed film Baadshah [ 1999 ] as Ninja Chacha in the film Hello Brother [ 1999 ] and as Takkar Pehelwan in Akhiyon Se Goli Maare [ 2002 ]. He acted in more than 90 films during his 23-year-long career. He was last seen in Kyaa Kool Hain Hum 3 [ 2016 ]. He was also there in the prequel Kyaa Kool Hain Hum [ 2012 ]. He also appeared in famous TV show Comedy Nights with Kapil as Golden Bhai [ 2014 ]. Sulabha Deshpande, an acclaimed film, theatre and television actress and theatre director died on June 04, 2016 after prolonged illness. Apart from Marathi theatre as well as Hindi theatre in Mumbai, she has acted in over 73 mainstream as well as art house cinema, like Bhumika [ 1977 ], Arvind Desai Ki Ajeeb Dastaan [ 1978 ] and Gaman [ 1978 ]. A leading figure in experimental theatre movement of the 1960s, she was associated with Rangayan, and personalities like Vijay Tendulkar, Vijaya Mehta, and Satyadev Dubey. In 1971 she co-founded, theatre group, Awishkar with her husband Arvind Deshpande, and also started its children’s wing, Chandrashala, which continues to perform professional children theatre. In recent years she acted in serials like Jee Ley Zara, Ek Packet Umeed, “Asmita” and films like English Vinglish. Sattee Shourie, who was Arjun Kapoor’s maternal grandmother, passed away on June 11, 2016 due to a prolonged illness. She had produced films like Farishtay  with Dharmendra , Vinod Khanna , Sridevi and Rajinikanth. The film was directed by Anil Sharma. She also produced television series Sheesha [ 1986 ]. In total ………..……… 17 ………..….. films got released in June 2016 . Out of these ……………..….. 17 …………………… released films ………………….. 09 ……………………… films have …………… 14 ……………. artistes , who are trained by me . Out of these ………………… 14 ………………… persons , …………… 13 ……… are actors and the remaining …………. 01 ……………… Dhaval Gada is the Producer of ” Do Lafzon Ki Kahani “ . 1 – Tara Sharma is presenting “Tara Sharma Show – Season 4” on Star World. 2 – Maheck Chahal is doing an important role in “Kavach … Kali Shaktiyon Se” on Colors TV. 3 – Urvashi Sharma is doing title role in “Amma” on Zee TV. My ……………. 03 …………..….. students in ………………… 03 ……………. TV shows . My 14 students appeared in 09 films & 03 students in 03 TV shows . Thus total number of students working in the month of June 2016 comes to 17 . 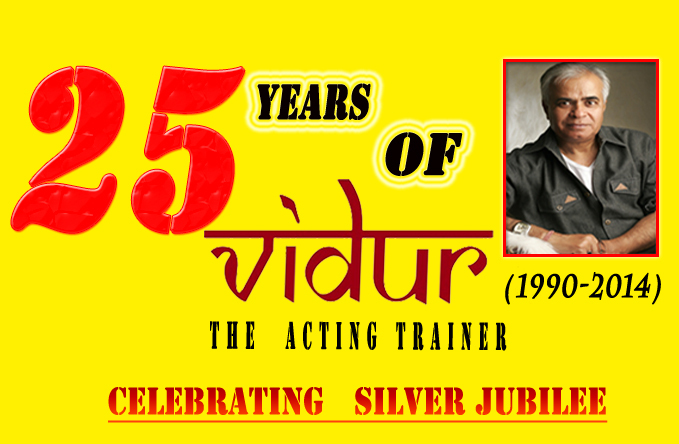 On behalf of all the students & staff of VIDUR Acting Institute , VIDUR Editing Studio , VIDUR Club and VIDUR Merchandise, I congratulate my above mentioned 17 students . MUMBAI – MAHARASHTRA – INDIA JUNE 18, 2015 00.30 A.M.
Dear Alumna / Alumnus of FTII, Pune ! I have already written 2 blogs about the FTII [ Film & Television Institute of India ] , Pune. 1st blog was written on March 28, 2010. It was about the declining and deteriorating standards of FTII. The 2nd one was written on October 28, 2012. It was about hubris and high-handed behaviour of students of FTII. 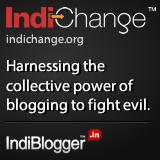 Today I am forced to write 3rd blog about FTII. I am reading in newspapers that alumnus of this so-called premier institute are agitated against Shri Gajendra Chauhan, the newly appointed FTII Chief. Nearly 150 students boycotted classes today and continued their protest for the 5th day. According to Harishankar Nachimuthu, the President of Student’s Union of FTII, Gajendra Chauhan’s appointment is a conspiracy to saffronise this prestigious ( ? ) institute. He states that he is not going to accept Shri Gajendra Chauhan as Chief of FTII. May I demand to know, who is seeking his acceptance or concurrence? I came to know that several past students [ who are jobless since time immemorial ] are holding meeting in Mumbai and threatening central government that they will fight against Shri Gajendra Chauhan, “a Narendra Modi stooge” till the end. According to them he lacks stature and administrative experience. May I demand to know, who the hell are they to decide, whether Shri Chauhan has the required stature or not? In the past Mr. Shyam Benegal, Mr. Mrinal Sen, Mr. Adoor Gopalakrishnan, Mr. Mahesh Bhatt, Mr. Girish Karnad, Mr. Vinod Khanna, Prof. U.R. Ananthamurthy and Mr. Saeed Mirza have served as Chairman of the Governing Council of FTII. They were appointed by the government of the day. 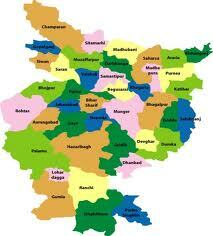 Shri Gajendra Chauhan is also appointed by present central government. I fail to understand, how can students demand to have a say in the appointment of Chief of FTII. Moreover, what stake do past students have in the affairs of their Alma Mater? Why are they agitated? Why are they threatening to “fight till the end”? Students and alumnus of this so-called prestigious institute should realize that their job is to get trained and not to decide about the governing council chief or other administrative matters of the institute. They must realize that the golden days of Shri Roshan Taneja are over. Their activism fails to produce a single actor of the calibre of ASHOK KUMAR, MOTI LAL, DILIP KUMAR, BALRAJ SAHNI, SANJEEV KUMAR, AMITABH BACHCHAN, SHAHRUKH KHAN, AMIR KHAN, HRITIK ROSHAN or RANBIR KAPOOR. None of the above mentioned actors are the alumnus of FTII. I also fail to find among your alumna, any actress of the stature of NARGIS, MEENA KUMARI, MADHUBALA, GEETA BALI, VYJAYANTIMALA, WAHEEDA REHMAN, REKHA or KAJOL. And you people are talking about the calibre of Gajendra Chauhan. I appeal to the alumnus of FTII to first become a world-class actor and then try to be an activist. The most important FTII alumnus and your biggest inspiration NASEERUDDIN SHAH is busy doing “world-class” ( ? ) films like “Sona Spa” and ” Jackpot” and you people are pontificating on the calibre of Shri Gajendra Chauhan and threatening Shri Narendra Modi. And now a word for failed ex students of FTII. You have no business to meddle in the affairs of your alma mater if you are still struggling to make a mark. No one needs your activism. You roam around in the alleys of Mumbai with stinking body, wilting faces, faded attires and dead and gloomy eyes. I pity your rancid existence and failed journey of life. The government of the day doesn’t need or seek your approval. Leave your hubris. You are not doing any favour to us or humanity if you are an ex students of FTII. Let me make it clear that your agitation is politically motivated. All the right thinking people know it. If it is not so, why people like Anand Patwardhan and other known left-liberals are joining your band wagon? Why students of JNU [ Jawahar Lal Nehru University ] , a breeding ground of leftist and pseudo seculars, are joining your protest? What stake have they in the FTII? You resist every change and want to run the institute as per your whims and fancies. When UPA appointed committee suggested running the institute on public-private partnership, you people protested. When UPA tried to make the syllabus more contemporary, you started indefinite strike. UPA government headed by Congress was not saffronising the institute. So it is clear that protests and strikes are in your DNA. Dear alumnus, if you feel or suspect that the appointment of Shri Gajendra Chauhan is a conspiracy to saffronise FTII, I suggest that you should learn to live with it as soon as possible. It will be better for your future, your health and your well-being. We have seen enough of your hubris. We have tolerated enough of your pseudo intellectual hypocrisy. It is time to say, ” ENOUGH IS ENOUGH “. On behalf of all the students & staff of VIDUR Acting Institute , VIDUR Editing Studio , VIDUR Club and VIDUR Merchandise, I denounce you for your hypocrisy, needless hubris and uncalled for activism. 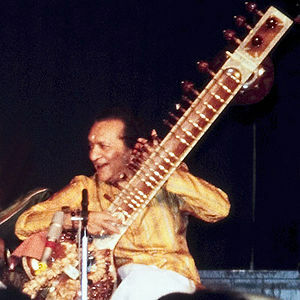 MUMBAI – MAHARASHTRA – INDIA DECEMBER 13 , 2012 11.59 P.M.
Pandit Ravi Shankar , a Sitar maestro par excellence , an unofficial ambassador of Indian classical music , the first India Rock Star in true sense of the term , died yesterday on December 11 , 2012 in San Diego , California , U. S. A. Apart from classical music , he had given music for some feature films also . This Chetan Anand directed film was his debut film as well as debut film of Pandit Ravi Shankar also . It starred Kamini Kaushal , Uma Anand and Zohra Sehgal . It was written by Khwaja Ahmad Abbas . This Khwaja Ahmad Abbas directed film was his debut film and the second film of Pandit Ravi Shankar . It starred Balraj Sahni , Tripti Mitra , K. N. Singh , Zohra Sehgal , David and Sombhu Mitra . It was written by Kishan Chander . This film was produced and directed by Hrishikesh Mukherjee . This film had lyrics by Shailendra and several gems sung by Lata Mangeshkar . It starred Balraj Sahni and Leela Naidu . This Trilok Jetley directed film was based on Munshi Premchand’s immortal novel of the same name . It had some immortal melodies . It starred Raj Kumar , Kamini Kaushal , Mehmood and Shashikala . This Gulzar directed film had several Meera Bhajans tuned by Pandit ji . It starred Hema Malini and Vinod Khanna . This Satyajit Ray directed film was his debut film . It is the first part of Apu Trilogy . This Satyajit Ray directed film was the second part of Apu Trilogy . This is the Bengali film based on Rabindra Nath Tagore’s story . A social satire directed by Satyajit Ray . Third and final part of Apu Trilogy . This Mrinal Sen directed film starred Shabana Azmi , Naseeruddin Shah & Om Puri was the last film of Pandit Ravi Shankar as music director . This Richard Attenborough film had Ben Kingsley in the title role as Gandhi . I made this list for the connoisseurs of film music and for the benefit of the acting students of my acting class Vidur’s Kreating Charakters .